Donald Trump is not the first American politician to achieve power through demagoguery and then to use that power for their own gain. Ninety years ago, a southern politician with a populist agenda was beginning to dominate American national politics: his bombastic rhetoric and narcissistic personality, cynical use of patronage, selfless addiction to power, and calculating manipulation of the media all foreshadowed the central characteristics of today’s Trump presidency. His name was Huey P Long, and his story is important as it offers insights into Trump’s presidency and suggests where it may lead and how it might fail. What Long’s and Trump’s stories share, besides a love of golf, is a reliance upon three themes which weave their way through the political drama of their respective lives. Firstly, a core populist, anti-elitist, insurgent, radical message which is virulently pro-change. Secondly, legislative programmes which, in contrast to the rhetoric, are consistently pro-conservative and supportive of vested and established interests. Thirdly, the deployment of executive action using the power of office to deflect criticism, obscure facts, intimidate opponents, and confuse critics who seek to highlight the gap between rhetoric and action. However, the reality of both men as legislators is that whilst talking the language of reform on the stump, in power they consistently supported the established order. Whilst Long’s legislative programme carried forward much that was positive, including unprecedented investment in public infrastructure, critically it shied away from tackling the most embedded problem of the state: land ownership and the pervasive role of sharecropping which kept the poor in their place. He was shrewd enough only to pick fights with those who were too powerless to oppose him. Unsurprisingly for someone who believes that government is itself the problem, Trump has found it difficult to push forward his legislative programme. His two successes, the partial rewinding of Obama’s Affordable Care Act, and last year’s $1.5tn tax cuts, however illustrate both his allegiance to big business and his sponsors, and the chasm between his campaign rhetoric and the practice of his government. Long ran a cynical, deeply corrupt political machine, systematically skimming public salaries to enhance his war-chest, using patronage to stuff public bodies with his placemen, fixing elections, rewarding family member and friends he trusted and using his physical, financial and political power not just to defeat but to crush opponents. In the creation of his own dictatorship he realised, in Hannah Arendt’s words, that “everything was possible.” A complex character whose contribution is deeply contested, Long was at heart a demagogue who prized power above all else. His programmes of social, political and economic reform were a means to an end: the sequestration and maintenance of power. Though not as extreme to date, similar abuse of power has characterised Trump’s first year in office. Using executive orders extensively to circumvent democratic scrutiny, padding the federal judiciary with friendly appointees, appointing members of his family to important and sensitive roles, systematically smearing both opponents and the executive and judicial branches of government, Trump has employed similar tactics to those used by Huey Long. 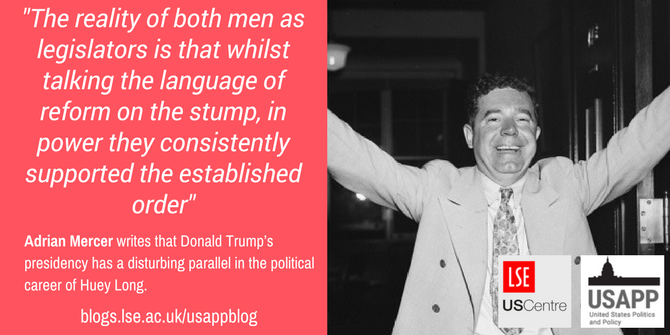 Given these similarities, in considering the future of the Trump presidency, what is the significance of the Huey Long story? 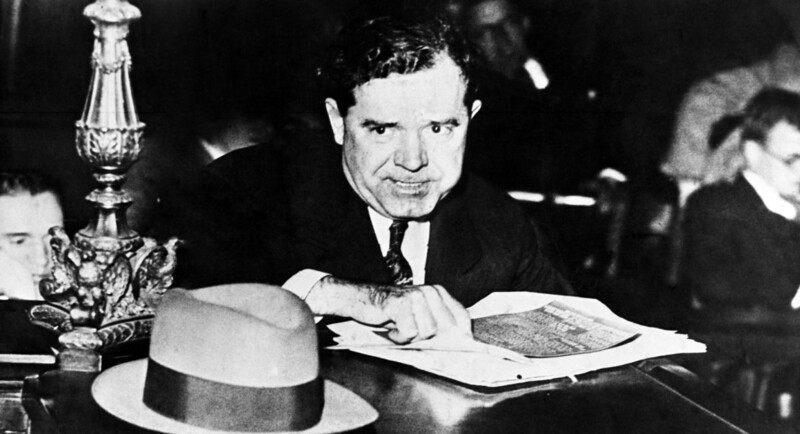 As Governor, Long survived impeachment for corruption and then became a Senator.in1932. He had just announced his bid for the presidency when, in 1935, he was assassinated by the son in law of a political opponent. In the months before his death, though, there were signs that Long’s popularity was waning as people began to see through the bluster, rivals reorganised, and his reputation as a comic figure transitioned to that of a feared dictator who posed a national threat. A resistance movement to Long began to assert itself on the floor of the House, further judicial investigations were launched into Long, and his public support ebbed as his ever-more ambitious promises were seen as increasingly empty.
. . . it is only in degree less true of him [Long] than of his predecessors and contemporaries in demagoguery that his chief accomplishment for his clientele was to delight and give outlet to their emotions, in the vision of themselves, made one flesh with him, swarming over the battlements of Wall street as embodied in the corporations, and driving out of power its minions, the haughty gentlemen of New Orleans and Baton Rouge.